The correct property maintenance and repair is essential to allow for reduced costs over time. As an English speaking surveyor in France, we undertake RICS surveys for clients wishing to buy properties and also for existing homeowners with recommendations for planned property maintenance programmes. We are increasingly seeing defects that are of significant scale often concerning large areas of the house fabric. These defects are not due to the normal passage of time and lack of maintenance. Ironically the defects are increasingly being caused by inappropriate maintenance undertaken with materials that are totally inappropriate particularly when applied to traditional structures. For example, the solid walls of traditional buildings were designed to be vapour permeable. Whilst this will allow some rain to soak into the wall, critically the damp will also be drawn from the wall by evaporation. So the house is able to ‘breathe’. This will have allowed the wall to remain in a balanced state of low moisture content for decades. This in turn will have drawn moisture away from structural timber joists embedded deep within the wall. By keeping the joist ends dry, they will have remained free from wood rot and infect infestation for decades. However, we are now increasingly seeing the inappropriate use of modern non breathable paints and cement based mortars incorrectly being applied to these structures. These materials will inevitably allow some moisture ingress. However this moisture and indeed that generated from within the house is not then able to escape by evaporation. It’s like wrapping the house cling film! 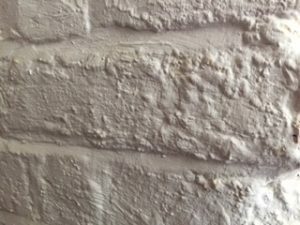 Modern ‘non breathable’ masonry paint trapping moisture within a brick wall. Note the ‘blistering’ as the moisture tries to escape. Accordingly the damp builds up within the walls over time allowing the degrading of wood from rot and insect attack. Damp masonry also degrades, with the damp causing corrosion of steel reinforcing rods and ‘blowing’ of render. The house will also feel damp and cold, often then resulting in increasing heating bills. It is important to have a property survey to professionally advise as to the logical sequence of works and correct use of materials. As an English speaking Surveyor in France, we not only assess and report on the current condition. We can also provide planned property maintenance programmes with the correct materials and paints so as to save you falling into the trap of having works done that are actually doing more harm and promoting the degradation of the structure.